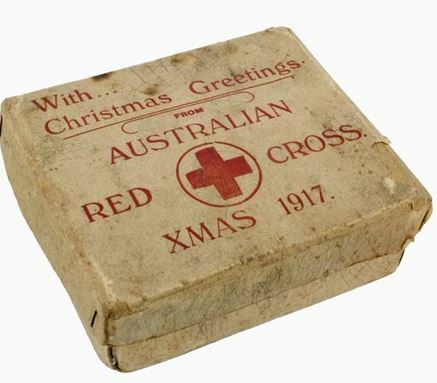 The Australian Red Cross distributes 50,000 Christmas boxes to patients in almost 400 hospitals, casualty clearing stations and command depots in France and Great Britain. The contents generally included a pipe, tobacco, cigarettes, chocolate, playing cards, a match-box, handkerchief and card. While Faith and Hope the souls of men uphold. To pierce the darkest of our gloomy days. Where clouds of hate obscure the rising sun. This entry was posted on December 25th, 2017.